Windstar Cruises is a cruise ship line that operates a fleet of small luxury cruise ships. Its six yachts carry just 148 to 310 guests and cruise to 50 nations, calling at 150 ports throughout Europe, the South Pacific, the Caribbean, and Central America. In May 2014, Windstar added to its sailing yachts by adding the Star Pride power yacht, followed by Star Breeze and Star Legend in May 2015. The additional capacity opened up new itineraries such as voyages to Iceland, Panama Canal, Costa Rica and allowed Windstar Cruises to sail Tahiti year round. 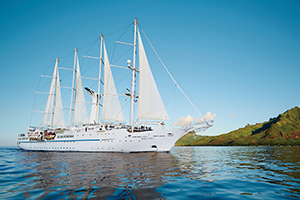 Windstar Cruises is named World's Best Small Ship Cruise Line by Condé Nast Traveler 2014 Readers' Choice Awards. The line was established as Windstar Sail Cruises in 1984, and its first ship, the Wind Star was launched in 1986, and was followed by the Wind Song which was launched in 1987 and Wind Spirit which was launched in 1988. Two additional ships were ordered from the French "Sociéte Nouvelle des Ateliers et Chantiers du Havre" shipyard: the Wind Surf and the Wind Saga. These two ships were to be larger than the originals, holding over twice the number of passengers and reaching a length of 660 ft compared to the smaller vessels of 440 ft in length. Holland America Line (HAL) purchased 50% of Windstar Sail Cruises in 1987 and purchased the balance of the company in 1988. HAL became a subsidiary of Carnival Corporation & plc in 1989. The option to continue building the Wind Surf and the Wind Saga was passed up by HAL. With assistance from the French Government these two larger ships were built for Club Med as Club Med I and Club Med II, with HAL / Carnival retaining rights of first refusal for purchase. A few years later, HAL / Carnival planned to buy Club Med I and Club Med II with permission. 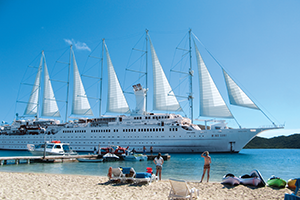 However, Windstar cruises was unable to purchase Club Med I and Club Med II and rename them to Wind Surf and the Wind Saga because they had only enough money to purchase one ship. So in 1998, Windstar acquired the sail cruiser Club Med I from Club Med Cruises, and rechristened her to her original name Wind Surf. In March 2007, Carnival sold Windstar to Ambassadors International for $100 million. On April 1, 2011, Windstar's parent company Ambassadors International filed for Chapter 11 Bankruptcy. A bankruptcy court in Delaware held a two-day auction and Anschutz Corporation won Windstar Cruises with a bid of $39 million. Subsidiary Xanterra Travel Collection is now the parent company. 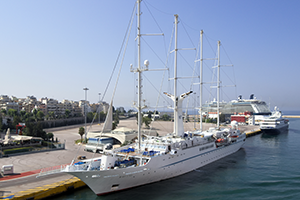 In 2013, Windstar purchased three more ships, effectively doubling the size of the fleet. Star Pride joined the fleet in 2014, while Star Legend and Star Breeze launched in May 2015. It was announced on February 19, 2013 that Windstar completed the purchase of Seabourn Cruise Line's Star Pride, Star Legend, and Star Breeze. The Star Pride entered service 5 May 2014 with an inaugural cruise from Barcelona to Rome. 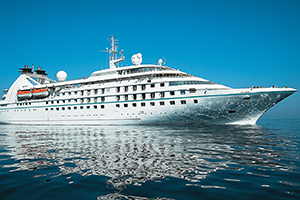 In May 2015, Windstar increased its fleet from four yachts to six with Star Breeze and Star Legend. Both yachts underwent a $17 million, three-week dry dock in Genoa, Italy, before a christening ceremony in May. Both yachts, each holding 212 passengers at double occupancy, received full stem-to-stern upgrades to the suites, public areas, and dining venues. 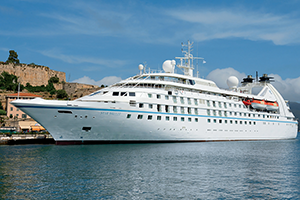 In 2016, Windstar is planning a $3 million continuation of the Star Pride renovation. The Star Pride received a partial overhaul in 2014. The continuation includes the completion of the AmphorA remodel, and a total renovation of the reception, Screening Room, and others. In June 2018, Star Legend became the largest cruise ship to ever travel through Seattle's Ballard Locks and the Lake Washington Ship Canal. In November 2018 Windstar announces that the Star Pride, Star Spirit and Star Legend will be lengthened about 25, 6 meters from October 2019 until November 2020 at Fincantieri, Palermo for 250 Million Dollar. The capacity will grow to 312 passengers instead of 212. The ships also will get new engines. Windstar is considered a high-end cruise line, with its ships typically getting a four-star (out of five) rating. The ships are relatively small, with the Wind Surf having a capacity for about 300 passengers and the others about 150. Star Pride carries up to 212 passengers in 106 suites as well as sister ships Star Legend and Star Breeze. The ships are registered in the Bahamas. Under this flag, they are some of the few cruise ships in the world where passengers are still allowed on the bridge (though not when entering or leaving port). With a shallow draft of only 14' the ships can enter ports that are inaccessible to larger cruise liners. In some cases, passengers need to take smaller boats into port (such as to Lipari) when the ship is at anchor. Wind Star. Built: 1986. Entered service for Windstar: 1986–present. Gross tonnage: 5,307 tons. Windstar Cruise's First ship. Wind Spirit. Built: 1988. Entered service for Windstar: 1988–present. Gross tonnage: 5,307 tons. Wind Surf. Built: 1989. Entered service for Windstar: 1998–present. Gross tonnage: 14,745 tons. Windstar Cruise's biggest ship in the fleet and was previously Club Med 1 for Club Med. Star Pride. Built: 1988. Entered service for Windstar: 2014–present. Gross tonnage: 9,975 tons. Previously Seabourn Pride for Seabourn Cruise Line. Star Breeze. Built: 1988. Entered service for Windstar: May 2015–present. Gross tonnage: 9,975 tons. Previously Seabourn Spirit for Seabourn Cruise Line. Star Legend. Built: 1990. Entered service for Windstar: May 2015–present. Gross tonnage: 9,975 tons. 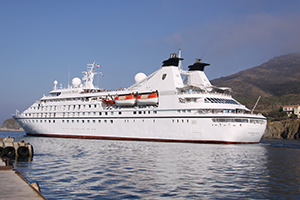 Previously Seabourn Legend for Seabourn Cruise Line. Wind Song. Built: 1987. Entered service for Windstar: 1987 - 2002. Gross tonnage: 5,307 tons.